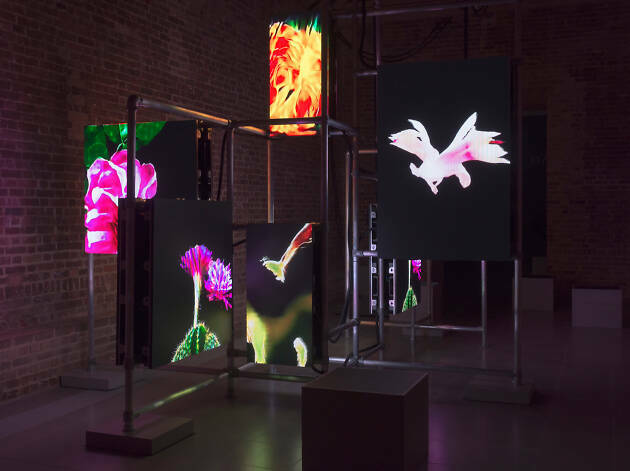 For this show of new work, Steyerl has created a horticultural neural network, apps and a series of documentary films that tear at ideas of social inequality and power imbalance. The area around the Serpentine Gallery is deeply divided. Kensington & Chelsea is home to Billionaire’s Row and sprawling housing estates, to the vast wealth of Kensington Palace and the injustice of Grenfell. It’s the perfect place to start. One of the apps Steyerl has developed visualises the data of that inequality. Point your phone or one of the iPads on display at the cryptic sigils dotted around the gallery and you can see the truth of what’s happening around you. There are quotes and stories from campaign groups in the area, architectural models of social imbalance. It’s pure digital grimness. One set of films follows locals campaigners on a walk in the park, talking about living in such a shockingly polarised environment. Suddenly your plush surroundings are tinged with discomfort. 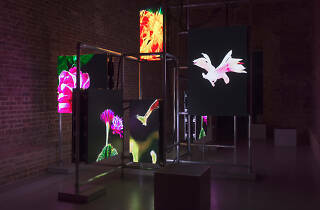 The rest of the gallery is filled with screens showing gently moving flowers and plants. Created by a neural network, each image is a prediction of how that organism is destined to evolve. It’s a vision set 0.04 seconds in the future, a future where seeds are sprouting from the destruction of the world around us. The sigils this time fill the screens of the gallery iPads with quotes from imagined books written in 2049. The whole gallery space is dark, filled with cryptic symbols, hovering technology and blooming nature. Somehow, Steyerl has combined all these disparate elements into a cohesive, beautiful whole. This is art that questions, exposes and attacks power structures. Steyerl uses technology to flay off the skin of an unjust society and uncover the corrupt flesh underneath. Above all, though, it looks incredible. Steyerl is swinging her art like a club, and you can feel every blow.